As we settled in and took a look at the menu, the manager gave us the green light to order whatever we wanted. Oh man, I could see Mijune's ey es light up. This was going to get ugly. 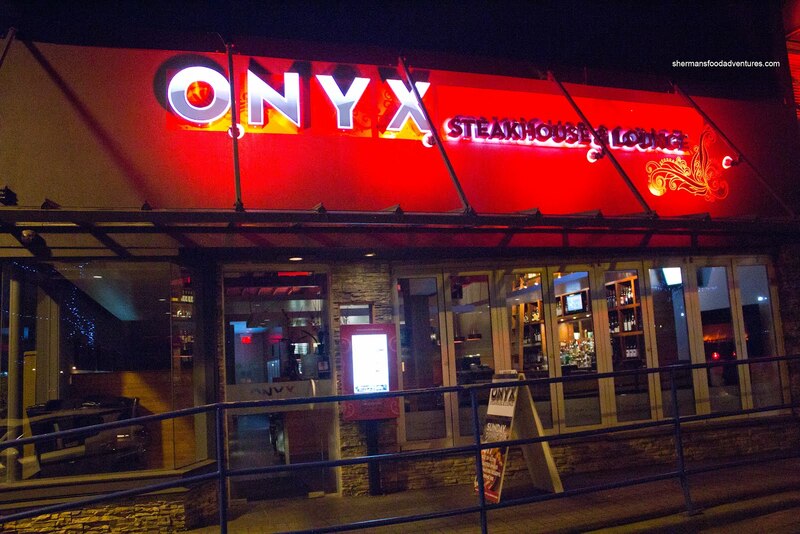 And so it began... with 3 appies starting with the Onyx Famous Cheese Toast. 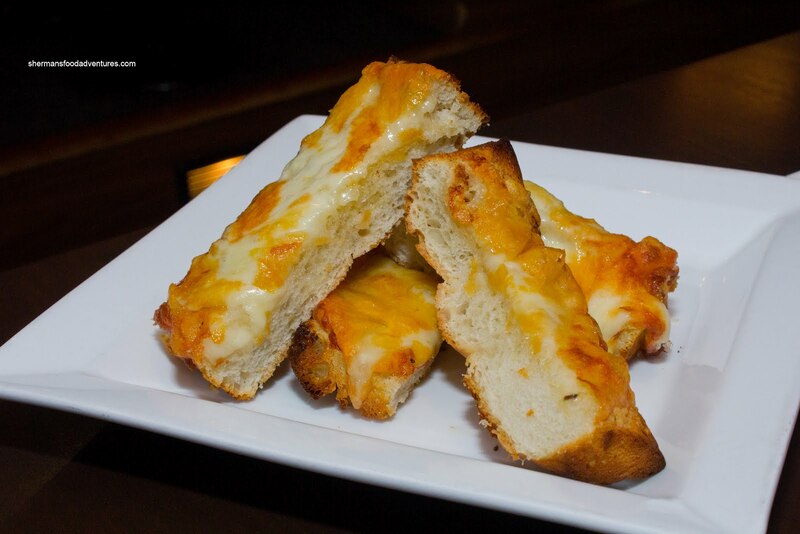 Cut into long strips or fingers, the cheese toast was crunchy and surprisingly not very greasy. The melted cheese consisted of grana padano, asiago, Swiss, provolone and white cheddar. Although cheesy, it was a bit difficult to differentiate the flavours. In fact, a bit more greasiness and a touch more seasoning would've went a long way in providing more flavour impact. Next up was the Escargot with house-made gnocchi, mushrooms and demi-glace. I first dug into the large gnocchi and it was quite dense. I prefer dense gnocchi, but this was unfortunately too doughy for my tastes. I do give them kudos for making it in-house though. On the other hand, the escargots were good. They had a pleasant texture and the rich demi-glace coated each and every one. We would've preferred a bit more seasoning though. With a small crank of the salt mill, that was all it need to put it over-the-top. 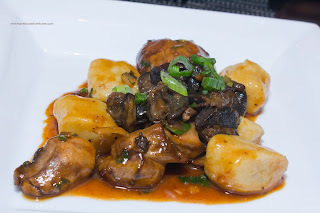 The enoki and button mushrooms along with the shallots in the demi-glace added a nice aroma. Our last appie was the Crab Cake with avocado creme fraiche and celeriac slaw. This was not a crab cake in the literal sense. Rather, it was deconstructed with the binding agent (bread crumbs) on the top and the "mayo" (which was the avocado creme faiche) on the bottom. Hence, there was no cooking per se in terms of pan frying. With this method, there was no crispy exterior other than the bread crumbs on top. However, this allowed the cake to be much lighter and highlight more of the crab. 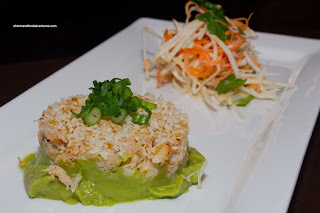 As such, I enjoyed the fluffy, sweet and savoury crab which was further spiked with flavour by the smooth avocado creme fraiche which exhibited a nice acidity. As for the slaw, it was crunchy with some ta ng. Moving not the mains, we shared a 10oz Filet Mignon which was prepared perfectly. And when I say that, I mean it. Look at the picture, it was evenly grilled medium-rare. Furthermore, there was a nice char and crust on the outside. The steaks at Onyx are Black Angus Signature Reserve dry-aged a minimum of 40 days. From the last time at their PoMo location, the tenderness of the steak was evident. It was no different this time. The meat cut and chewed easily. Since beef tenderloin is not as flavourful as some other cuts of meat (like prime rib and striploin), t he accompanying bacon mushroom demi-glace was a welcomed finishing touch. 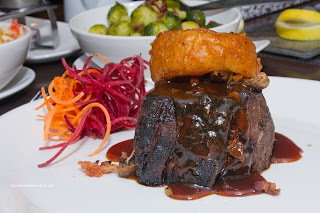 The rich demi-glace had body and was able to flavour all of the meat. 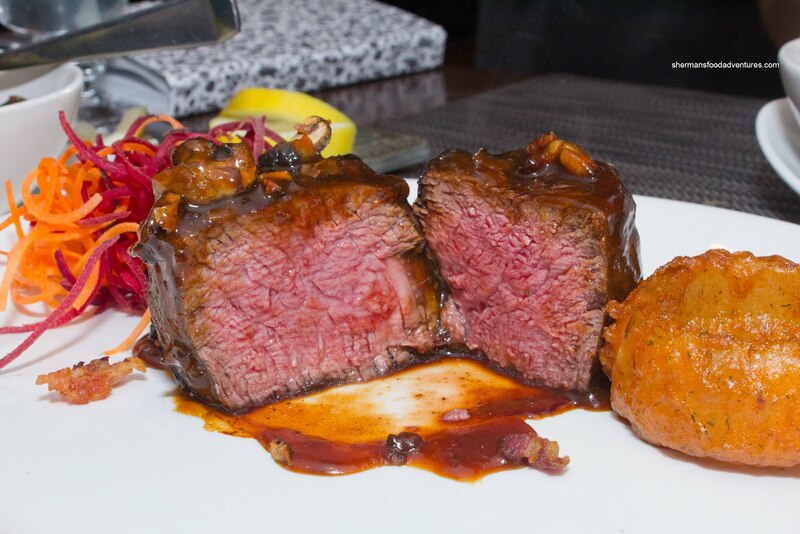 And besides, bacon + filet mignon is always a great combination. As with all of their a la carte meat offerings, a large dill batter onion ring finished the plate. 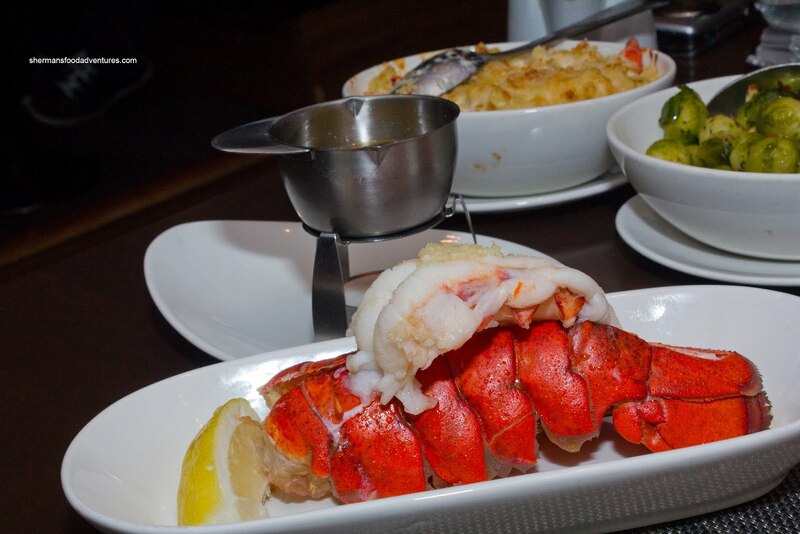 We also added a Lobster Tail for good measure (how could we not?) and it was done to perfection as well. Served with a side of melted butter on a chaffing dish, the lobster had a nice snap and the addition of some garlic on top only helped bring out the natural sweetness. 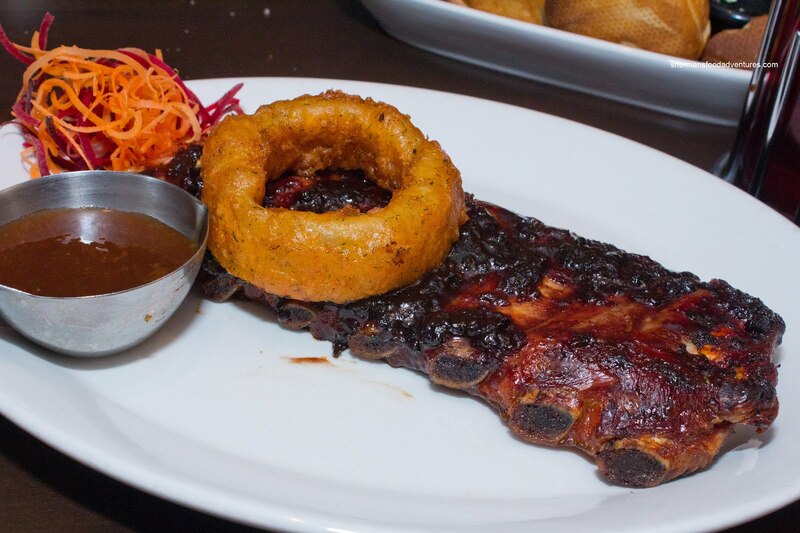 To change it up a bit, we decided to give Baby Back Por k Ribs a try. We opted for the chipotle blueberry BBQ sauce with a side of the peach BBQ sauce. From the first bite, it was apparent that the ribs were not parboiled. Instead they were cooked from raw. Now this is a personal preference issue. I know many people who prefer that their ribs not be boiled first because it could lose flavour and texture. Alternatively, some like it fall-off-the-bone tender and don't really care about the supposed "blasphemous" boiling technique. For me, I don't mind the parboiling because I like it to fall-off-the-bone. With that being said, the ribs here were chewy, but not so much s o it wasn't incredibly hard to eat. Meat aside, what I really liked was the BBQ sauce. Normally, blueberries lack acidity or punch to make for a good BBQ sauce base, but with the addition of chipotles, that was the one thing that brought it all together. The sticky, thick sauce had it all - sweet, savoury, spicy and tartness. With all this food so far, we didn't need 5 sides right? Well, with Mijune, how could we not? 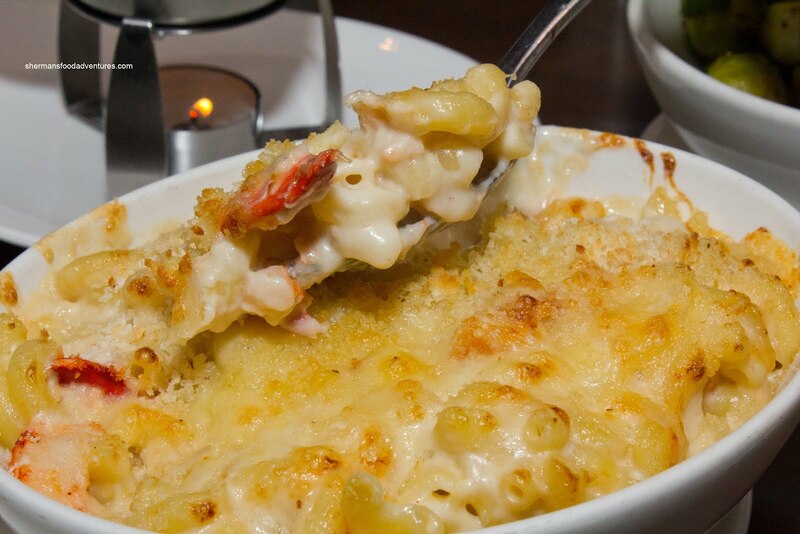 First up was the Truffle Lobster Mac & Cheese. I had this at the PoMo location and there was one major discrepancy - much more lobster meat. Normally, this would not be a bad thing. 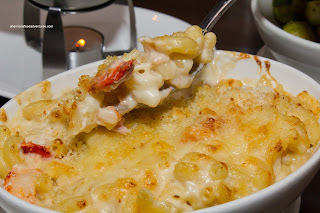 However, most of it was claw meat (which has a spongy texture) and it really didn't add anything to the mac & cheese. It was completely understandable why the claw meat was used in the mac & cheese. After all, lobster is expensive, no one in their right mind would use exclusively the tail meat (unless the dish cost 3 times more). Otherwise, the mac & cheese was creamy and rich with only a modest hint of truffle. 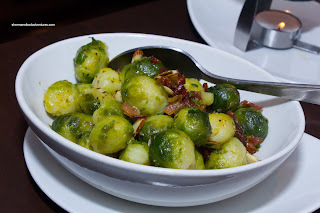 We had high hopes for the Bacon Almond Brussel Sprouts and ultimately it fell flat. Loved the bacon on top, it was smoky, crispy and just plain awesome. The brussel sprouts? Not so much. It was merely boiled where it lost all of its vibrant colour and texture. If the sprouts had been either cooked less or actually deep fried, we would be singing a different tune. 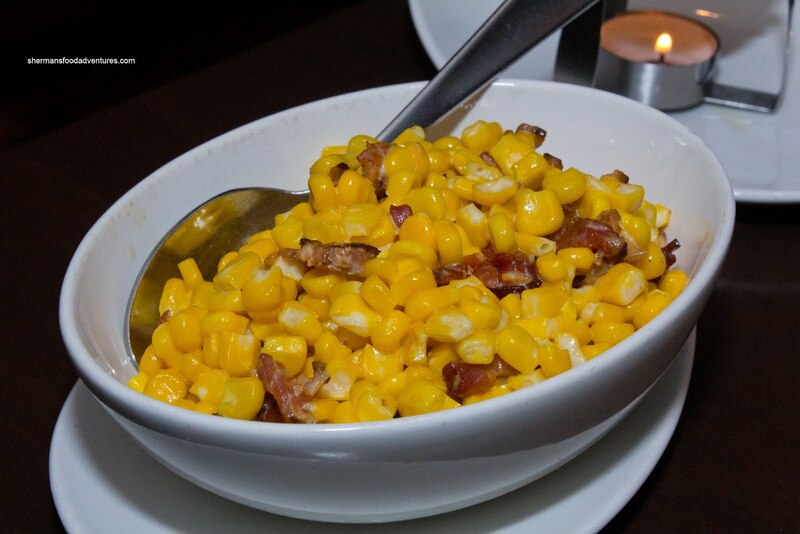 When I first laid eyes on the Bacon Creamed Corn, I was perplexed. Where was the cream? Looking closely, there was only a modest amount of fresh cream. Definitely not what I was expecting, yet it was probably my favourite side. The corn niblets had a nice snap which let out a burst of sweetness which was balanced nicely by the g ood amount of bacon. As I took more bites, I could understand the lack of cream. Too much would've made this particular version too heavy. I liked how I could keep eating it without feeling too bloated. From one creamed item to another, we had the Panko Almond Creamed Spinach. This was my second favourite side of our meal. The spinach was not mushy and still had a considerable amount of texture. This was the key since spinach can easily be overcooked and become a big pile of goop. 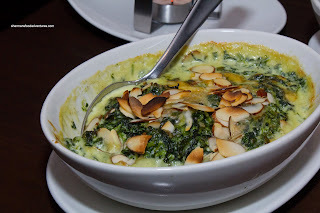 Unlike the corn, the creamed spinach was indeed very creamy. If they added more cheese, this would've made a good d ip. 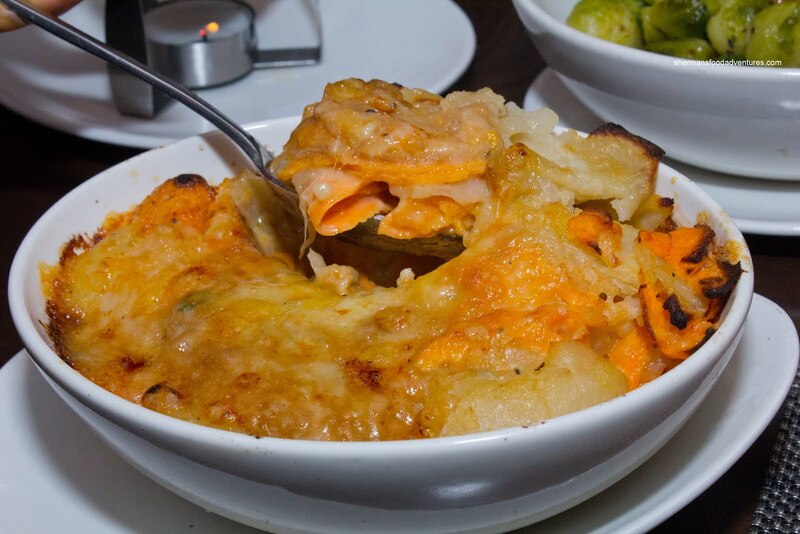 Our last side was the Organic Yam Gratin which was predictably heavy. We thought it resembled more like scalloped yams (because the crust on top wasn't all that prevalent nor cheesy), yet that didn't mean it wasn't any good though. The yams were soft, sweet and laced with creamy richness. Believe it or not, we almost dusted off all of our dishes (except a small portion of the mac 'n cheese and yams, while we didn't really touch the brussel sprouts). Of course we had to share 3 desserts too right? Blame Mijune. We tried the Apple Cr isp first and again, they really should have named it differently (much like a few items we had). Maybe an apple pie of some sort would've been more appropriate because there was nothing crispy about this. Again, that wasn't a huge deal since I liked the dessert despite the name. The apples were plentiful, tender and nicely textured. The whole thing wasn't too sweet and hey who doesn't like a big scoop of ice cream on top (was a bit icy though). Next up was the same 2 desserts I tried at the PoMo location. 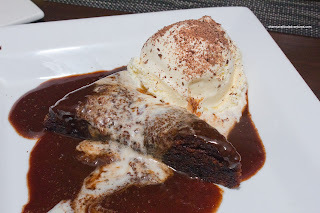 I swear the Chocolate Sticky Toffee Pudding was even s weeter this time around. I realize that toffee is mostly sugar, but I couldn't have more than a few fork-fulls of it. 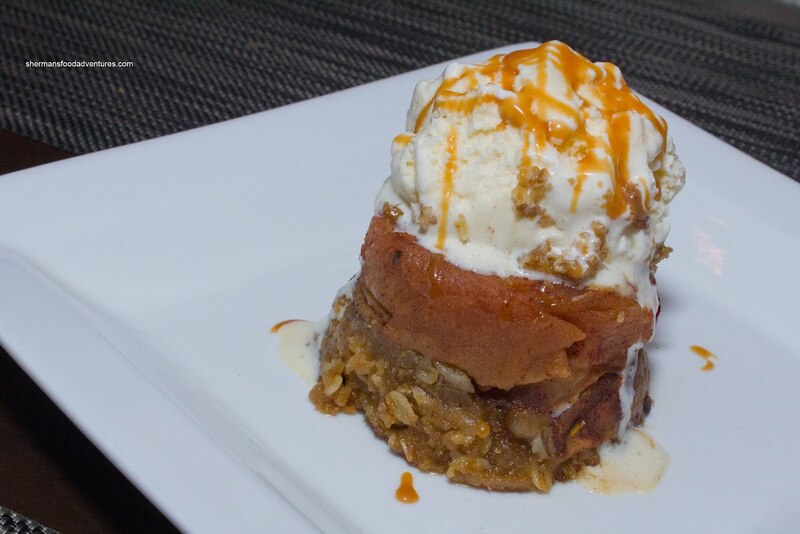 There was nothing inherently wrong texturally or conceptually about the dessert other than the stinging sweetness. 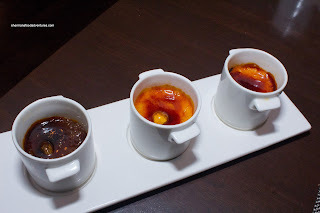 Lastly and mercifully (because I was so full), we had the Creme Brulee Trio consisting of Bailey's, Tahitian Vanilla Bean and Dark Chocolate. The torched sugar crust was a touch thicker than the one I had in PoMo, while the custard was pretty much the same. A touch on the denser side, the custards were not overly sweet with the chocolate being my favourite. It reminded me a of a rich thick version of chocolate mousse . The Bailey's was spiked pretty aggressively which I didn't mind while Mijune wasn't a fan of it. Cheap drunk... Overall, I would say that the meal was mostly good with a few duds (brussel sprouts and the gnocchi). However, with the shear amount of items we had (thanks Mijune...), the batting percentage was pretty good and that is all we can really ask for.